Elie Blanchard aka Yro is a multidisciplinary artist based in Paris. In his performances and installations, he blends music and video combining “old” and new technology. Yro‘s work brings together image & sound, both of which he creates alone and in collaboration. His audiovisual universe is dark, monochromatic and geometrical. 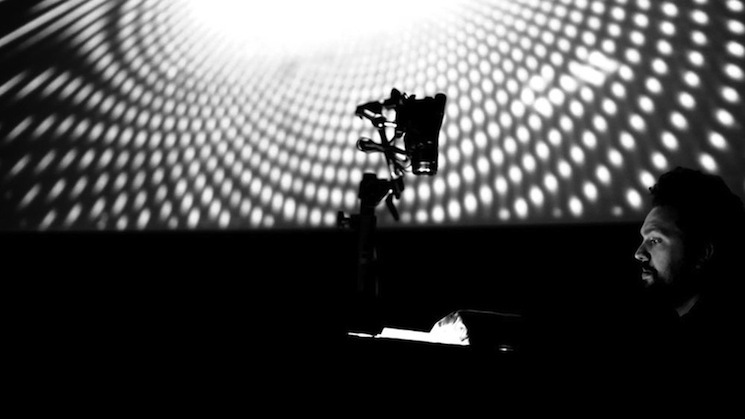 He is one of the pioneers of the live cinema movement and also the founder of the audiovisual festival Visionsonic. He was nominated for SHAPE by Arcadi Nemo. Do you always do both visuals and music at the same time? Yro: It depends on the project. I always do the visuals, but sometimes I also do the audio. When I collaborate with another artist, we try to create audio and video at the same time, so they are really connected to each other. I’m working with a lot of different materials and I like how collaborations push me. How do you choose the people to collaborate with – do you have a preconceived idea and approach someone with it, or you develop it together? Y: For Triangles Irascibles, we had five residencies in different venues and developed the project step by step. I didn’t ask Erwan Raguenes to make music, I asked him to come into a process of creation. And of course, everything he did or said became part of the project. I’m not choosing the people, I’m working with them. Can you talk about your use of new and old technologies, their combination of techniques and processes and the interplay between the two in your work? Y: Combining these processes is the result. But the original idea is to give the audience an experience. I want them to become part of the process of imagination even though it’s a bit abstract. When I’m about to work on a new project, I never think about technology in the first place. It’s only a tool, a mirage. In Triangles Irascibles, I’m manipulating old black & white photos. If I was born a hundred years ago, I would probably do almost the same thing. I like to show the process, to play with lights, shadows, photos and objects. Because we are in this century, I’m doing this with a video projector, but I’m going to use a slide projector in a future project. What is the most important aspect in your work? Y: Emotion. What the audience feels after a show. Take part in it, imagine new things, relive your own life. I really like the idea that at the end of the show people can say that it reminded them of their childhood or teenage years. The audience makes up fifty percent of the show, they do the connection between the photos, objects and abstract things. With Triangles Irascibles, it’s an experimentation of cinema, of how minimal you can be while still telling a story which is playing with the idea of family and death. Of course, these are b&w photos and everyone has them at home. It’s universal. How do you know that this organism, created in a live context with an audience and a performer, worked? Y: You can feel if you lose people or have 300 people looking at you. I can sense after the first millisecond during an applause if people liked it or not. It’s really strange how you are connected to people. I’m on stage, doing the manipulation, people look at me and I look at the screen, it’s back and forth. It’s really interesting to loose people and then regain their attention. I don’t want to have music playing all the time or thousands of images flickering really fast, I take my time. I think it’s the opposite of what we see in the a/v scene these days. It’s just me with the screen, camera, photos and my instruments. I’m doing 100 percent of the film on stage. I can’t do something super amazing. What is amazing is the experience of the present. Can you talk about live cinema and your involvement in it? Y: I’ve been working on the idea of live cinema for the last ten years. It’s strange, because cinema is cinema. Live cinema is creating an experience of cinema, but on stage, which somehow is really hard because in cinema, you have the idea of the cut and the editing. Live cinema is a new idea of producing things and it takes a lot of time to prepare. I’m actually not sure it takes less time than making a movie, but it’s changing and evolving which is really interesting when you’re going to perform the same project 30 times. With Triangles Irascibles I play with family archive and photos of friends of mine and anonymous people, photos taken in my city and in my flat. Before I start to play, I try to find some fragility inside. In the photos, there are some people who are already dead, people from my family, there’s me as a child. Sometimes I don’t find the right way to play, sometimes I find a kind of perfection. That’s why I like to experiment with the distortion of a work. The story is evolving with me, and I don’t feel the same like I did two years ago when we started the project. Two years ago, we were expecting our daughter and I was asking myself about family, giving life and my own death. I did this project because I probably needed to share all these feelings. What about the element of chance, and something unexpected happening during a performance. Do you take this into consideration when you’re playing on stage? Y: I remember a performance I did ten years ago and at the end of it, while I was still performing, suddenly there was a power cut. I had to finish with just a small LED lamp. People thought it was part of the show and that was super strong. I mostly use chance and unexpected elements in the process of creation. I like the idea that something could always go wrong in the live context. I also like the idea that if you can do a bad performance, you can still do the best one ever. What are your artistic inspirations? Y: I like cinema. I really like Georges Méliès’ work, the animations of Norman McLaren, a Canadian director, Chris Marker (particularly La Jetée) and many more. I’m also really inspired by Etienne Robertson who had a theatre during the French Revolution in 18th century. These were sort of pre-a/v performances with no electricity and everything made with candles. They created amazing and powerful experiences with just magic lanterns and optics machines. Can you talk about how you got involved in the audiovisual scene in the first place? Y: I started doing street shows with a collective when I was 15. In 1996, I did some stuff with slide projectors and lights in a thoroughly analogue way. I started to play with a computer in 2002/2003. There was already a huge scene of people doing visuals, playing with a lot of psychedelic effects, 3D…I remember thinking about the meaning of it. More colour, more flickering, more and more and more… all the footage in a computer played by a software. And? I’m using objects, photos, lights. Everything is tangible, real, imperfect. My objects are scratches, they are not unchangeable and that makes all the difference. And the audience can feel this fragility.